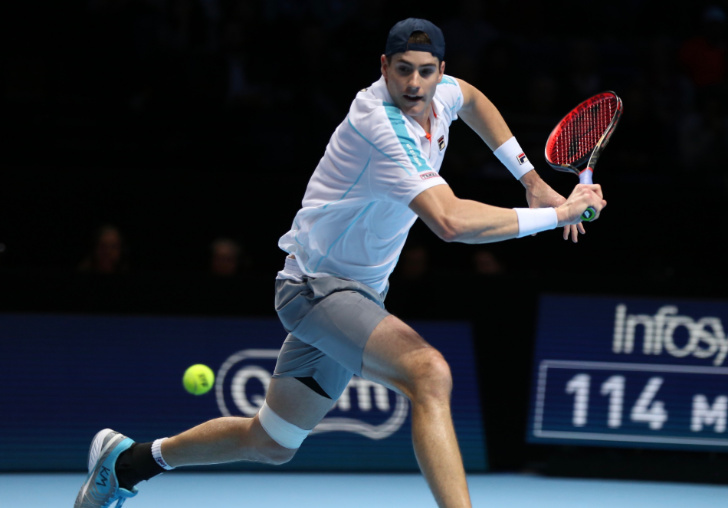 Uppermost in the eyes of many as John Isner and Marin Cilic took to court on Wednesday night was, would world No1 Novak Djokovic be the only man among the eight singles players at the World Tour Finals this year to seal a semi-final place after just two rounds. With his win over Alexander Zverev and John Isner in straight sets, the top seed was now within touching distance of the semis for the eighth time. If the tallest man ever to play in the tournament, the 6ft 10ins Isner, beat the fellow 30-something Marin Cilic—no undersized player either at 6ft 6ins—Djokovic was through. But if Cilic won in three sets, Djokovic was also through. Cilic had a 7-3 advantage over the 33-year-old American, but Isner had won three of their last four matches. For all his success in the last 18 months—two Major finals, three Masters semis, five more Masters quarters, a career-high No3—Cilic’s record at the O2 was a disappointing one. Now into his fourth ATP Finals, he had managed just one round-robin win, 1-9, and although he had the initial lead against Zverev on Monday, he was edged out of both sets in a tie-breaker. Just what would be the impact of such a life-changing event on a man already coping with one the biggest weeks of his career, his first qualification at the ATP Finals, and all after winning his first Masters and reaching his first Major semi-final at Wimbledon? It could inspire him to great feats, or it could drain his spirit and make him long to be home. Isner did indeed start like an inspired man. After a nervy opening game, he fired down four aces to hold, and it was nip and tuck through the set, neither man giving an inch: They would each drop just four points on first serve. It was Cilic’s turn to face down break points in the 10th game, three of them, but he did so: It would, perhaps inevitably, go to a tie-break between these big serving, big-hitting men who were both keen to take control, come forward, keep points short. Indeed, Cilic made 8/8 at the net. Once at the tie-break, Isner got the first advantage, 2-0. Cilic got the next point, but they changed ends at 5-1 in the American’s favour. There was some steel about him, and sure enough, after 54 minutes, he served out the set, 7-6(2). 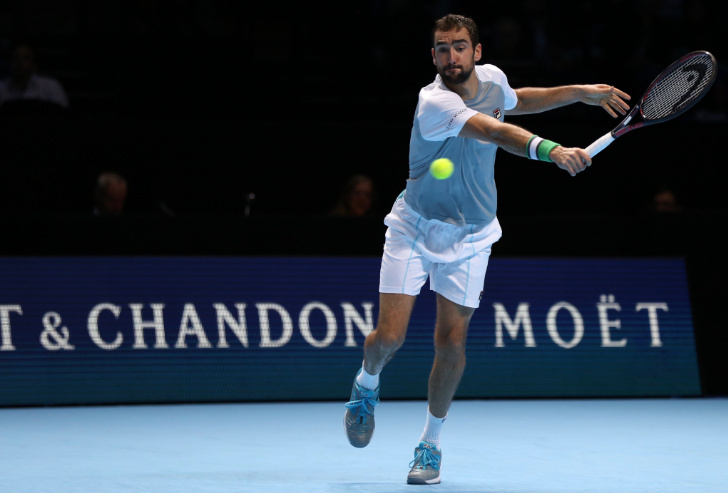 But Cilic now found some extra vim in his backhand, and forced two break chances in the sixth game of the second set. Isner’s serve saved the day, but not in the eighth game. The American’s first serve began to let him down, and although he fought off two more break points, he double faulted on the third, 3-5. It was a quick matter for Cilic to hold with an ace, 6-3. The momentum, and indeed the energy levels, now seemed to favour Cilic—though by this stage, whoever came through, Djokovic could sleep easy in his bed knowing he was into the semis. The first games of the final set showed just how badly each wanted to keep their hopes alive. First Cilic broke in a long opening game of four deuces and four break chances—only for Isner to break straight back. But the Isner serve was not doing enough damage, his first serve percentage now under 60 percent and with just three aces in the entire set. It gave Cilic the opening to take control, break and hold that advantage. He served out the win impressively to love, 6-4. He now has only to play the five-time former champion, who even with a head cold, has looked impregnable thus far in the tournament. Djokovic can also now play with freedom in the knowledge that, win or lose, he will be around for the final two days. Cilic has a formidable 16-2 deficit against the Serb, but may take encouragement that his two wins came among their last four matches, including the title match at Queen’s in June. What is more, all their last three contests have gone to three sets, most recently a fortnight ago on the indoor courts of Paris Bercy. There is still hope, then, that Cilic could make his best run here—but it is also still mathematically possible for any of the remaining three to advance. But he cut a sad figure in talking of the impact of his friend’s death. Those years together were on show on court tonight, as they have been all year. The big man moves better, bends lower, lasts longer than ever before. A legacy, of sorts, to their friendship.